Self-editing is one of the most important things we should do before we send a novel to an editor. 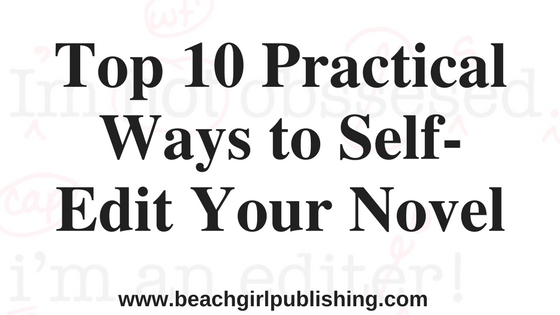 We should also self-edit before we send an article, blog post, short story, or other writing to a client if we’re freelancing. We need to make sure whatever we’ve written is the best it can be. You’ll save money with an editor if she doesn’t have to fix every little detail. You’ll keep your client if he likes your freelancing work. So how can you make sure your novel is in its best form? Maybe this helpful hints below will help you. One of the things that sticks out to me after reading Stephen King’s On Writing is that he said to leave your manuscript sit. Don’t look at it for six weeks. Six weeks isn’t possible for a short piece you have to send to a client, but I do leave it sit for at least a few hours and look at it with fresh eyes. With novels, I do leave them sit for at least six weeks. It’s amazing to me how much different they look after you haven’t thought about it for that long. For my first edit, I always print out the novel. There is something about having it in your hands on paper that makes it different, too. I can make notes, color code those notes, or do whatever I need to help me make it better. I never enjoyed reading out loud when I was in school, but as a former English teacher, I read out loud to my students many times in the two years I taught. For some reason that changed my mind about reading out loud. Now I read everything — novels, blog posts, articles — out loud. I can hear how it sounds and fix things that don’t sound right or don’t make sense. When reading out loud, you can hear the wrong words. For instance, maybe you used “good” instead of “well.” Maybe you mixed up the three — they’re, their, and there. Writers all have words we use repeatedly that don’t need to be used. I admit I used “just” and “really” way to much for my first novel. I never noticed how many times I had used them until I had it printed out and read it out loud. Know what those words are for you and avoid them. As an editor, I look for punctuation mistakes because those are the easiest ones to spot. Commas are often either overused or not used enough. Quotation marks are another problem I see, like not putting the period inside during dialogue. If you’re not sure about a type of punctuation, you can always find websites that can help you. Passive verbs are boring. I used to be bad at using passive verbs. Using active verbs makes your sentences stronger. You can make your writing sound so much better when you use an active versus passive verb. For instance, an example of a passive sentence might be “The concert was performed by Rick Springfield.” But you can change that sentence to “Rick Springfield performed the concert.” See how much better that sounds? While writing my first novel, I learned not to use adverbs. Again, King says this in his book. Adverbs are a great example of needless words. For instance, you don’t have to say someone said something angrily if in the next sentence you write he slammed the door. We can guess he’s angry because he slammed the door. How many times have you heard this in your writing life? I’m not hearing it as much as I used to, but it’s stuck in my head for the rest of my life. My mind constantly thinks about how I can show something instead of telling the reader about it. The point of view, or POV, is important to every novel, story, blog post, or article. In a novel, you can’t switch POV in the middle of a scene. You’ll confuse the reader. However, you can change POV at a scene change. For freelancing, your client may want blog posts or articles written in second or third person. You can’t switch to first person or switch back and forth between second and third person. What self-editing tips can you add to this list? Want to read past posts?